Whether it is a paper book or a forum, bookmarks are a key tool for staying engaged with relevant content. With [TH] Bookmarks, allow users to bookmark posts, threads, nodes, media items and resources in your forum. 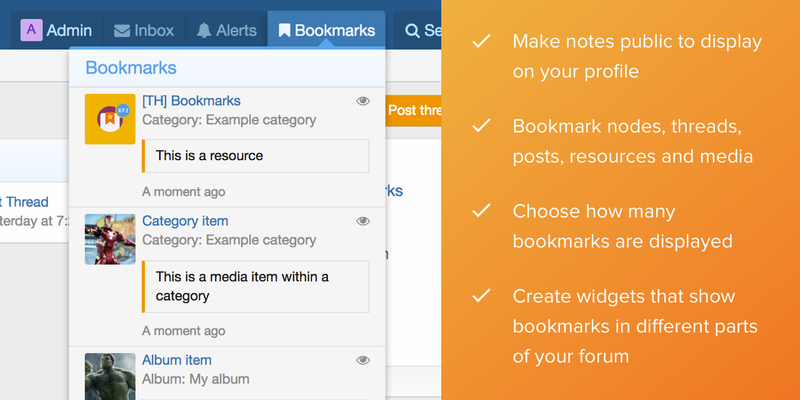 Users can even make notes on their bookmarks bringing even more value and functionality. Import bookmarks from Xon's/AndyB's bookmark add-on! You can learn more on how to do this by navigating to our documentation.